With mountain snows blocking a direct west route from Reno to San Francisco, through the infamous Donner Pass. The Flyer was forced to turn south through Death Valley, then north to San Francisco. While crossing a creek at Twin Springs Ranch, NV the Flyer stripped the pinion gear, and started sinking slowly in the quicksand. 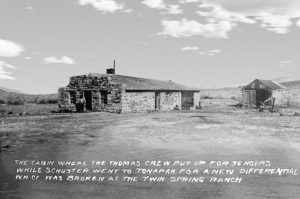 George began walking to Tonopah for the needed spare parts from a doctor’s Thomas purchased a year earlier. Returning he had to slide under the Flyer in the quicksand to replace the damaged part. 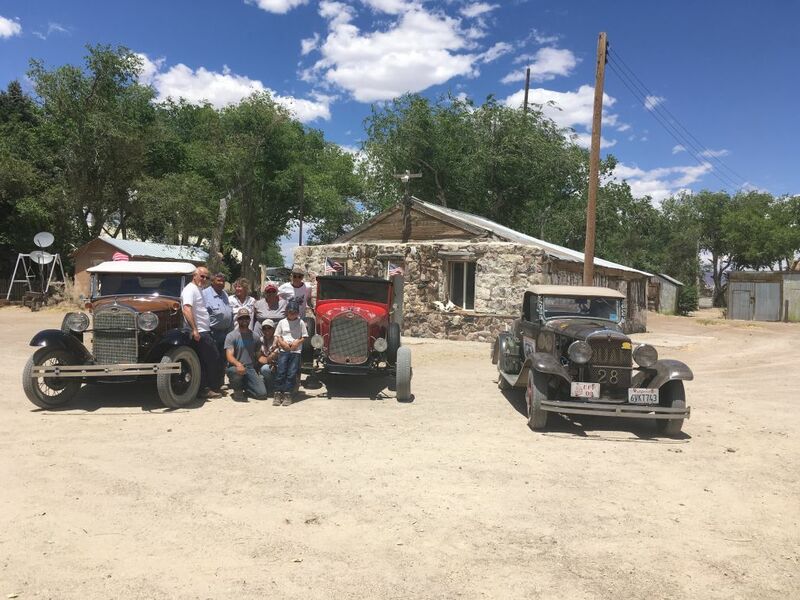 On the way to Tonopah, we had to stop at the Twin Springs Ranch which has a special place in automotive history. 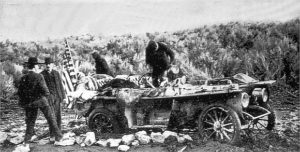 Certainly, one of the most challenging points on the 1908 route and because the Fallini family is still there working the ranch just as Giovanni Fallini did in 1908! The old stone bunkhouse still stands, and we got to meet the family Joe, Susie, Anna, and Ty. Their son, 10 year old Gio who’s Great Grandfather Giovanni would have greeted my Great Gramp when the Flyer became stranded while crossing the creek was also there. The picture below is of the stone bunkhouse as it looked in 1908, and above as it does today. We got to see the place the Flyer forded the stream (though much deeper now), and the quicksand is still there. The ranch has grown, and they now roundup the cattle with their helicopter in addition to horses. They even have a public school (grades 1-8) on the ranch for area kids, who live too far from the nearest school in Tonopah. There is something special about this place, with a strong sense of family and the traditions of western cattle ranching!